The early 1970s were a different time. Despite the riots of the 1960s, Detroit was still a going concern. There were a lot of people who lived and worked there, and it would be a decade more before it became the setting for a post-apocalypse movie. There were still over 1.5 million people who lived there, and it was the fifth-largest city in the US. It was Motor City, with a billboard on the freeway leading in that showed how many automobiles had been produced by that day of the year. It was Motown, the record company of Berry Gordy, with a recording studio in a house on West Grand Boulevard, known as Hitsville, USA. The Miracles, the Marvelettes, the Supremes, the Four Tops, the Jackson Five, the Spinners and Gladys Knight & the Pips all recorded hit songs for Motown Records. Richard Davis owned a pizza shop in Detroit, and there had been a rash of armed robberies of pizza delivery people. He got a suspicious call, and rather than send his driver, he went himself. He went armed, and ended up in a shootout. (Detroit has always been Detroit.) As he was driving himself to the hospital (as I said, it was a different time and place) he thought “There’s got to be something you can wear that will stop a bullet.” And the idea that came up was for soft, concealable body armor. After much experimentation, and a patent from the U.S. Patent Office (don‘t believe others, he has the patent to prove it) Richard was in the soft body armor business. Body armor that wasn’t a metal cuirass, such as worn by cavalrymen since the days of Sargon the Great. But cloth, ballistic nylon in the earliest years, that stopped bullets as if it were metal. Except, his customers, police officers, were more than a bit leery. I mean, really? Think about it. A few layers of cloth are going to stop a bullet? And not knock you silly? After a few demonstrations of shooting his vest, he bit the bullet, and took the hit. Literally. He would stand in front of a group of police officers, turn a handgun onto his vest, and shoot himself. No urban legend this, I’ve seen it personally, and more than once, in the old days. 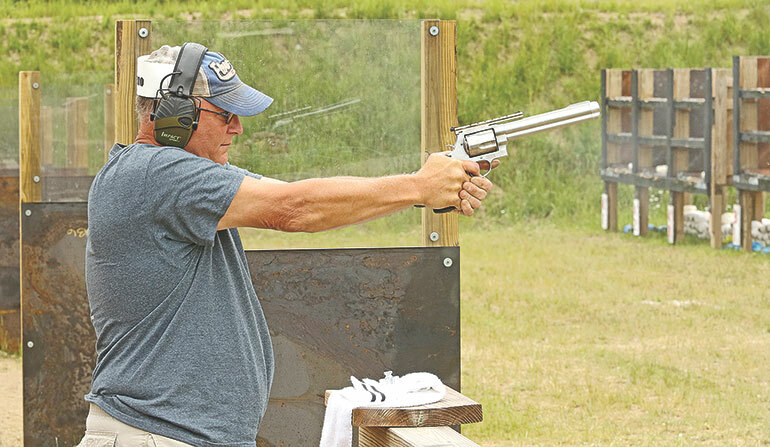 Firearms News Editor Vincent DeNiro even remembers a story, from the early 1980s, where Richard did this demo inside a police station as told to him by his first boss who owned a small reloading company in Ohio. The story ended with Richard selling all of the vests he has in his car. The rough and ready days of demonstrations of bullet-proof vests. Even after seeing it, people were reluctant to believe it. Being the stubborn, reality-based guys and gals they were and are, they were still skeptical. I mean, who wouldn’t have been? The noise, the blast, the impact, they all would disorient you, right? And wasn’t he using down-loaded ammo? Soft-recoiling, and soft-hitting, target ammo? Richard took to asking someone in the crowd for their gun, and using that. That broke some of the ice of skepticism, but there was still the disorientation “problem”. While future wearers remained skeptical, there were early-adopters who were living proof. Literal, living proof. One of my customers was the very first firearms “save” with a vest, Detroit PD Detective Ron Jagielski. He told me later about the day he stayed in the hospital, because the doctors simply wanted to make sure he was OK. After all, they’d never seen this before. “Again, and again, I’d see someone from the department poke their head around the door, looking to see if I really was still alive. It got old pretty fast.” Officers would radio in a break to go off-duty long enough to drive to the hospital, walk to his room, and make sure the rumors they’d heard were true. 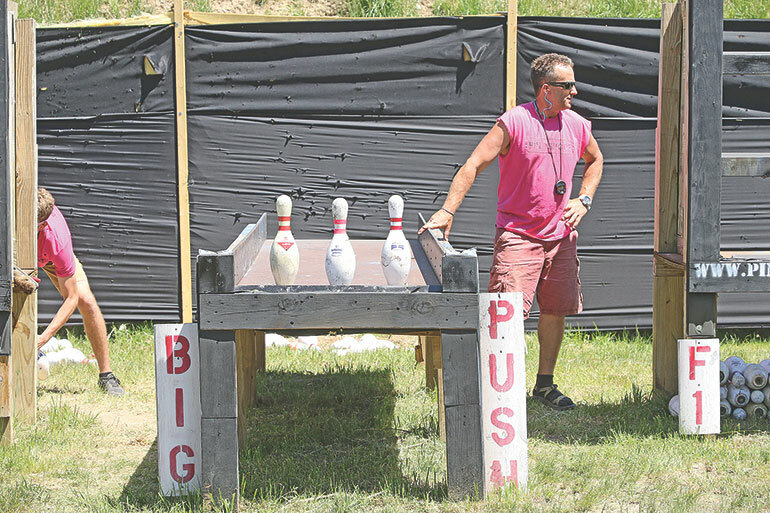 What Richard realized was that he needed targets for his demos, targets that reacted to being hit, that were common, inexpensive, that everyone knew what they were, and could be found any place he put on a demo. 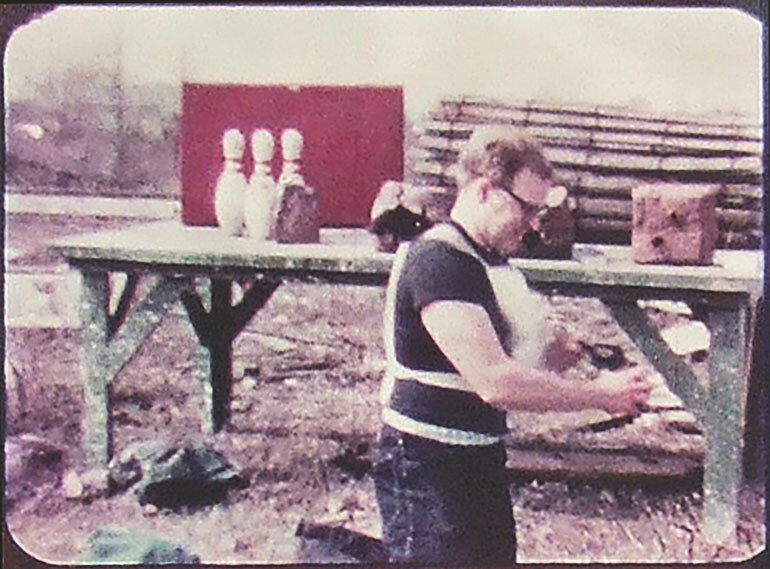 From then on, at demos, he’d set some pins up on a rail or table, borrow a gun from the crowd, shoot himself on the vest, then turn and mow down the pins. That did it, vests sold like hotcakes. Well, that and guys like Ron going home each night, from wearing vests. With bowling pins, there is no scoring committee, no chrono stage, no arguments over major or minor. The pins do the deciding, and they brook no arguments. If your load is insufficient, it fails. It didn’t take long, but someone remarked “Richard, except for the part where you shoot yourself, that shooting of bowling pins looks like fun.” And the match was born. He had a few people over, set up pins, timed the efforts, and then awarded prizes out of his own safe. You’ve all heard the old adage “Be careful what you ask for” right? Well, soon after that backyard match, people started asking “When is the next one?” and that was that. 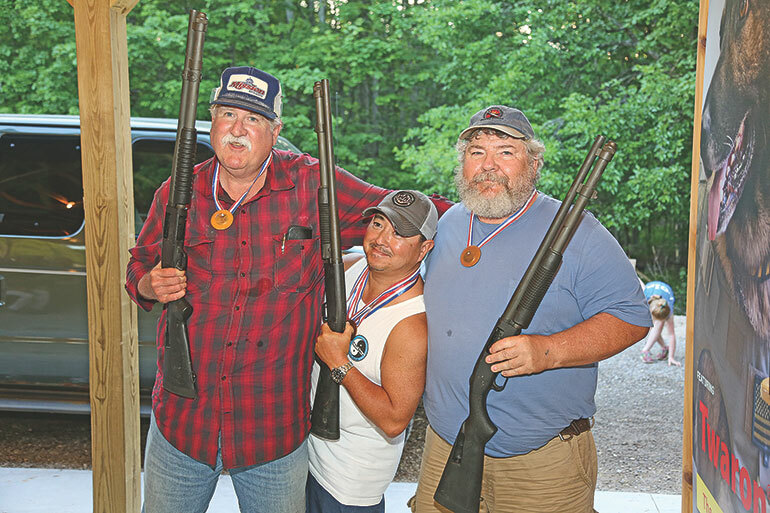 Richard soon found himself the operator of an annual shooting match. The earliest years were closed, limited to law enforcement only, simply because he was selling vests to law enforcement only. But after a few years it got big enough and known enough, that he opened it to all comers. I didn’t arrive until 1984, but I was already hooked, our club had been shooting pins at home for a few years by that time. 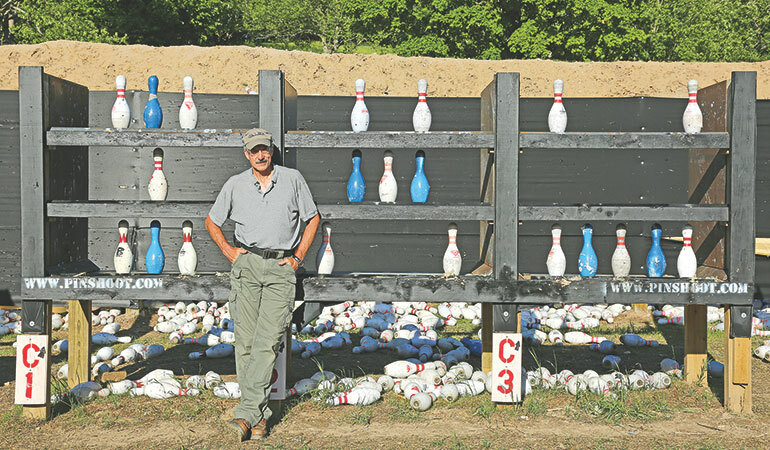 OK, a bit of background and physics on bowling pin shooting. 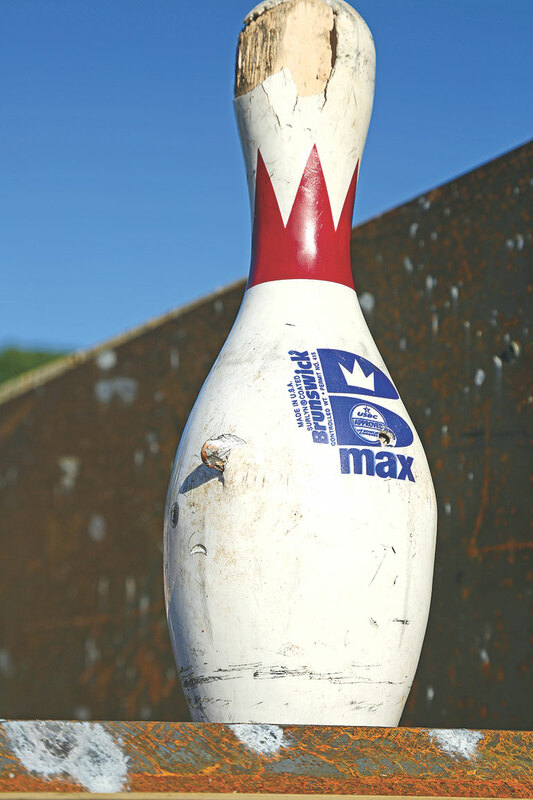 Your standard, regulation bowling pin weighs between 3 pounds six ounces and three pounds ten ounces. It is only four and three-quarters inches wide at its widest part. They are made of epoxy-laminated maple blocks, turned to shape on automated lathes, then covered in a durable plastic, a plastic tough enough to offer strenuous resistance to bullets. This is an important detail to keep in mind when considering bowling pin shooting. 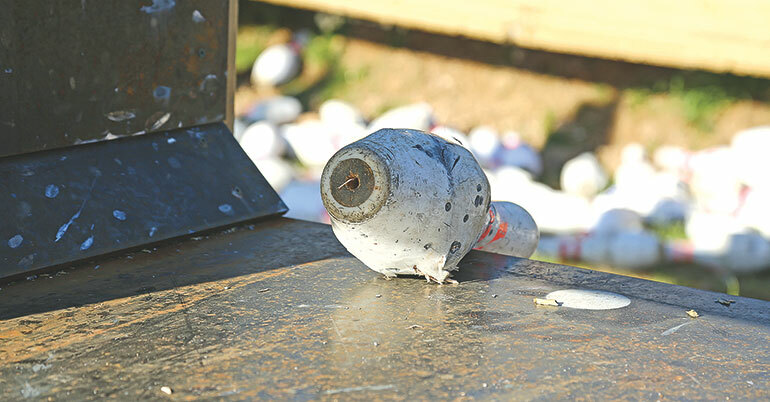 You see, if you do not shoot a bullet at over 700 fps at a bowling pin, you may not fully penetrate the plastic skin. Leaving a bullet base protruding from the pin does two things: it provides a location for other bullets to bounce off of, and it keeps the pin from rolling. Both are bad. If you load your own ammo, keep your speed up, well over 700 fps. Factory ammo suitable for pins will almost certainly be over 700 fps. If you shoot pins in the top part with a really big non-magnum pistol like the .50 GI, you can bounce them off the tables. But the margin for error with this tactic is microscopic. Use something bigger. This is generally not a problem, because of the scoring methods. There are two scoring methods used in pin shooting: off the table, and tip over. Tip over is easy, because that is the province of 9mm pistols, and nobody makes a 9mm load that goes as slow as 700 fps. 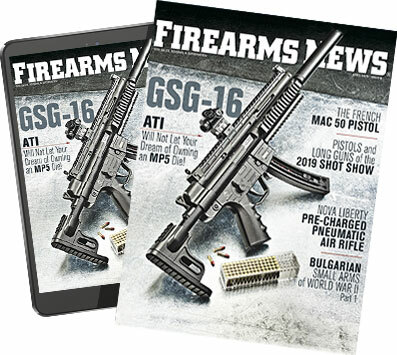 Your vanilla-plain 9mm load of a 115 grain FMJ (you can buy it by the bucket, easily enough) is going to be going 1,100 fps, and you are golden there. The off the table scoring is more difficult. You see, in these events (there are a slew of pin-shooting events you can enter) you have to push the pin off of the table and to the ground. They will be on a steel-topped table, and the back edge is three feet behind them. No 9mm Parabellum load can do that, that’s why there are tip-over events. It takes a full-power .45 ACP, better yet a .45 ACP+P load or equivalent, to broom them off reliably. Some clubs do not use steel-topped tables, and when their wooden tables get shot-up, you’ll need even more power. The 10mm acquits itself well on pins. the .40 not so much. If you have a choice, bring a 10mm, and make sure it is loaded to .45 ACP+P levels. Which is easy for the 10mm to do. Here’s a tip that will save you much anguish: the .357 Magnum will do it, as will all the larger-bore revolver calibers. You need a magnum load in .357, but not in the bigger bores. The 10mm does it with ease. The .40 S&W, despite what you’ll see on paper, and what your chronograph will tell you, is marginal at best. Every year, someone (or several someones) would arrive with “hot” .40 loads, and fail. Sometimes miserably. Revolvers work as well as pistols, and there is a revolver-specific event as well. Revolvers work just fine on pins, you simply have to have strong loads, and shoot fast. OK, physics aside, what is the process? Let’s start with what is rightly and traditionally called The Main Event. Actually, four of them these days, but they work the same. You arrive on the line with your handgun and ammo. You will face a steel array with three bays in it: One Two and Three. Each has five white pins, the targets. They also have three blue pins, the penalty pins. Your handgun starts in your hands with no more than eight rounds in it. On the start, (a very loud blank gun) you lift your pistol off the rail (no movement, no “cover”, no work on tactics) and shoot the five white pins off of table One just as fast as you can. Your score is the time it takes to get the last one on the ground. Each blue one tipped over adds a second to your time. You reload if you need to finish, because time does not stop for fifteen seconds. 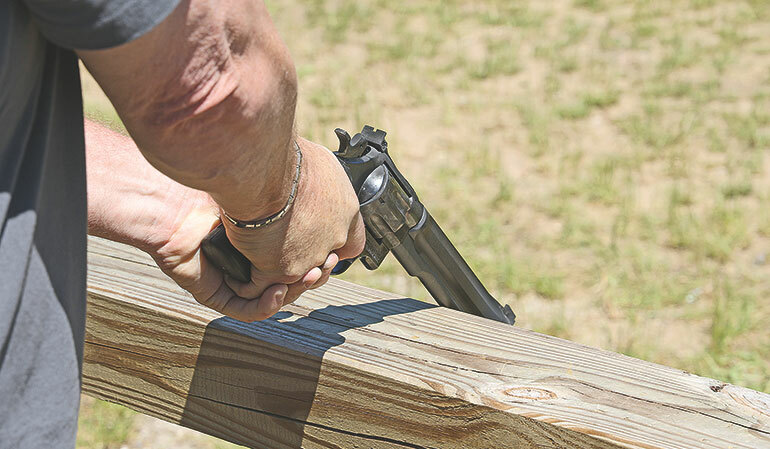 The start position is the same for all events: the gun has to be touching the rail. No draws, no movement, no cover, just you shooting as fast and accurately as possible. Take a breath, reload, step to the middle, and repeat on table Two when that blank start goes off. Then again on table Three. 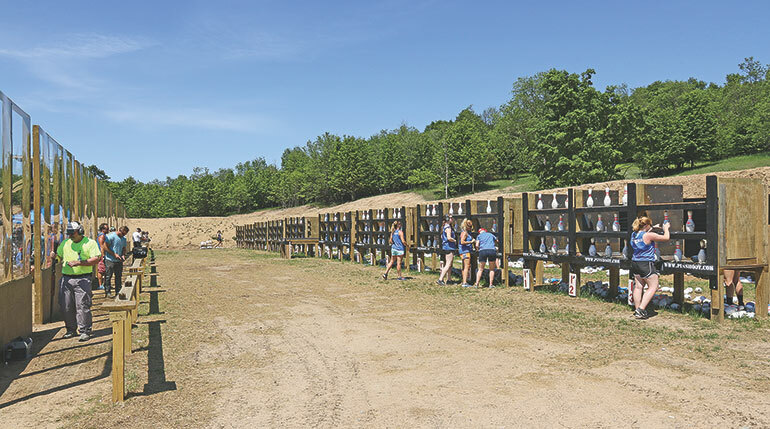 Unload, take a breath, reload your magazines, calm your shakes, and take a break while the pinsetters stand things up again. Do it all over again, for three more tables. Your score for that Main entry is the sum of the five fastest tables, your sixth table, the throw-away, is your tie-breaker. That’s one Main Event entry. Now, back in the prehistoric days of Disco and Urban Cowboy, the tables were like Kansas: big and flat. A table was a 4' by 8' sheet of steel, with five pins on it. Now, the table array is a tiered design, and the bays have sidewalls. In the old days, if a pin went off the table sideways, you were fine. Now, they have one direction: back. Fail in that, and time keeps ticking. Hence the power you need. Also, back then, there were just Pin and Stock gun categories. The Main Event now has four divisions or categories. (No where will you get to shoot as much as at The Pin Shoot.) Those are: Pin Gun, Stock Gun, Space Gun and Concealed Carry. You can enter all four, but enter each only once. If that was all you did, The Pin Shoot would be a pretty good match. You fire an absolute minimum of 30 rounds per entry, so 120 total. Any misses, any pins that you’ve tipped over and have to clean up (pins left on the table are called “deadwood) and you’ll obviously need more ammo. Three guns, for three of the four Main Event entries. 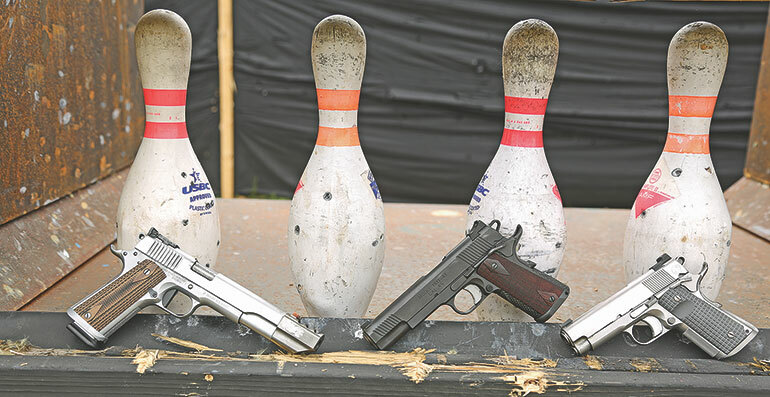 Left to right: Pin, Stock and Concealed Carry. These took time to grow and evolve. In the beginning, there was only one. Then it got split into Pin and Stock. Today, with so many pistols sporting red-dot sights, there is Space, and since we all carry, but don’t carry a full-sized gun, there is Concealed Carry. 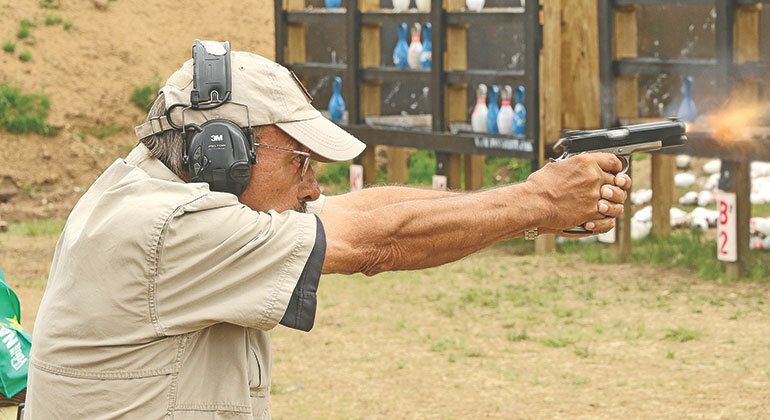 Oh, and trivia question: do you know how comped pistols for IPSC shooting came about? Yes, that’s right, from pin shooting. 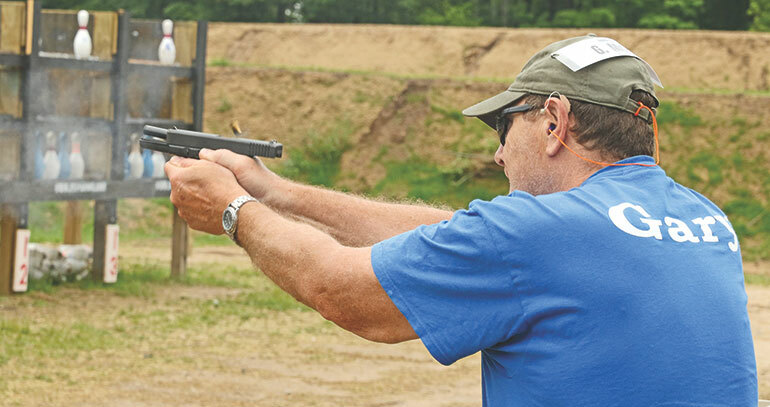 J. Michael Plaxco took a heavy-barrel with extended muzzle-weight 1911, machined an expansion chamber into the weight, and started winning pin shoots and IPSC matches with it. That was 1981. Practical shooting has not been the same since. The scoring process of The Pin Shoot? Simple: there is a crew of timers assigned to each table. They stand behind you with stopwatches ready. They click time-on when the blank goes off, and they stop when your last pin hits the ground. The times are compared, averaged, and your time, to a tenth of a second, is written down. That’s right, a tenth. That’s why your tie-breaker is so important. The timers and pin setters also have to keep track of the pin-set for each event. The array of pins is not the same for every event, and each team has a set of diagrams to keep it straight. As I said, if this was all there was, it would be a pretty grand shooting match. But, there is more. A lot more. There are the Optional Events. The Optionals differ in one great respect to the Main Event: you can enter an Optional as many times as you want, and only your best single run counts as your score. Really, not the total, but the best single run. With your second-best run used as your tie-breaker. Shoot until your wallet, ammo, or daylight runs out. Or, it is Friday afternoon, and the match has ended. With the single best run counting for score, “turning the wick up” becomes the norm. Shooters will step up to shoot, warm up shooting, post a good score, then post a good tie-breaker, then go for the gusto with a match winning pace. Tie-breaker? Yes, if you, say, shoot well in an event, and post a time of (let’s just pick a number) 3.6 seconds, that’s good. If it is the fastest time, you win. If someone else also shoots a 3.6 second time in that event, then the tie-breaker determines the winner. 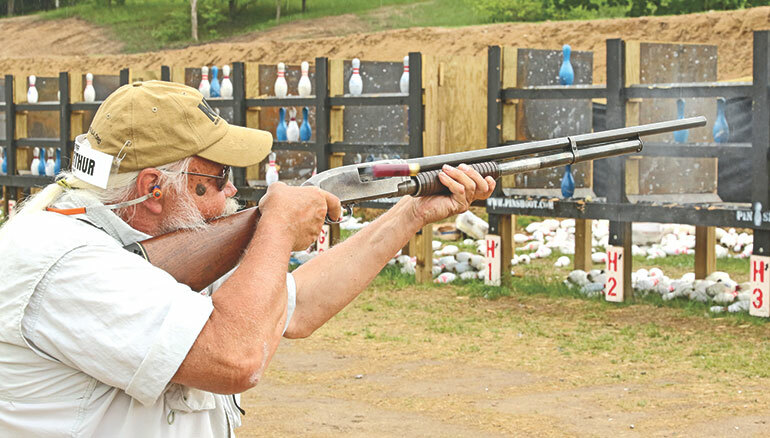 Top shooters will re-enter not just to improve their time, but to improve their tie-breaker. I have won events based on my tie-breaker, in the past, and again just last year in the 2018 Pin Shoot as well. And what are these Optionals? I’m glad you asked. This is the pin array you’ll be faced with, in one entry of the 9x12. Tip over the white pins in one bay, don’t touch the blue pins, and do it faster than anyone else, and you will be hailed as a hero. You get three tries per entry, hence the three bays. Here you are faced with 12 white pins and three penalty pins. You need only tip them over, so hi-cap 9mms rule the roost here. Any reliable hi-cap 9mm will do. Any factory-level 9mm ammo will do, even the plain-jane 115 grain FMJ you buy by the literal bucket at the big-box store. Any out of the box hi-cap 9mm will get the job done in the 9x12 event. You don’t need an expensive pistol to win, just lots of practice. And I do mean any hi-cap 9mm. 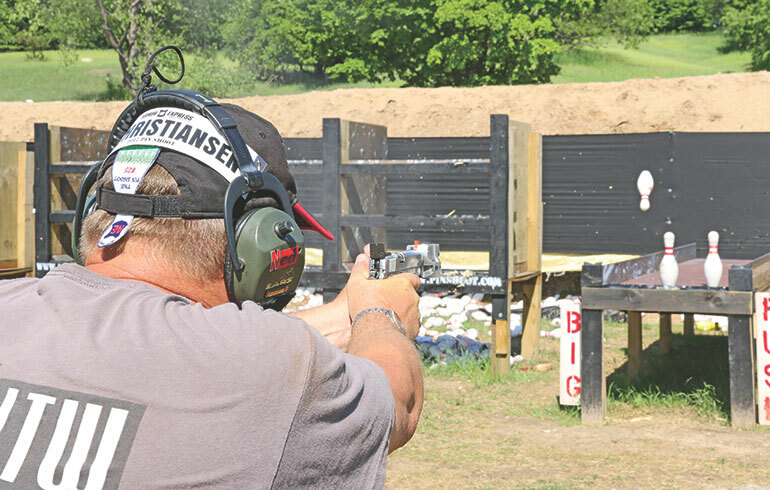 Yes, you will see expensive, purpose-built 9mm pistols used in this match, but the winner is just as likely to have used a police trade-in Glock, M&P or an import from Turkey. Also, this is not limited to just 9mm pistols. 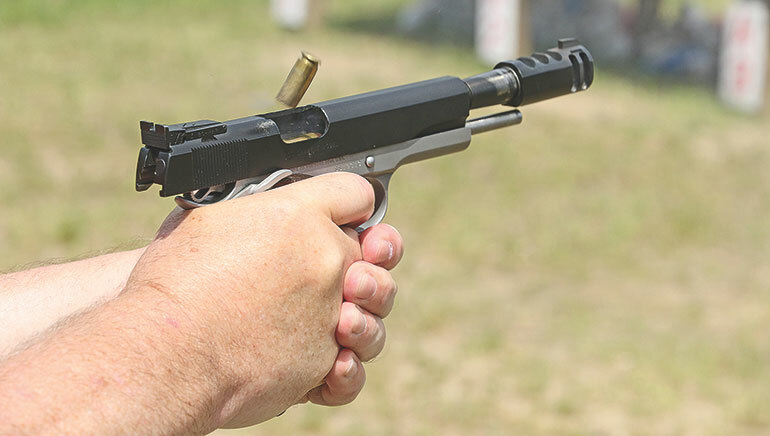 Oh, 9mm is the preferred caliber, and most shooters will be using one, but if you have a 40 S&W pistol lying around you haven’t been using much lately, you can use that. Admittedly, factory 40 will be more power than you need, but if you are there to shoot fast and have fun, go for it. If you want to load your own, just remember the advice above: keep your bullets over (well over) 700 fps. In that instance, stock up on plated 155 grain bullets, and load them to 825 fps. You’ll do fine. You need to use buckshot on pins, and they have to be larger than #4 buck. Load eight, but leave one or two on the rail for clean-up, in case you need to have a good tie-breaker. Eight pins, no penalty pins. Buckshot only, and no #4 buck or smaller. Eight shots in the gun. Pump shooters get a second off their real time. Women get another second, two total if they use a pump shotgun. You must clear the pins off the table. Any gauge you want, but remember: buckshot, and no #4s. I know what you’re thinking: “Buckshot at 25 feet? How can I miss?” the answer is: gloriously, messily, embarrassingly and with great gusto. At 25 feet, most cylinder-bore shotguns throw a pattern of buckshot that is not much larger than your hand. You do have to aim. What you should do here is simple; pattern your shotgun. 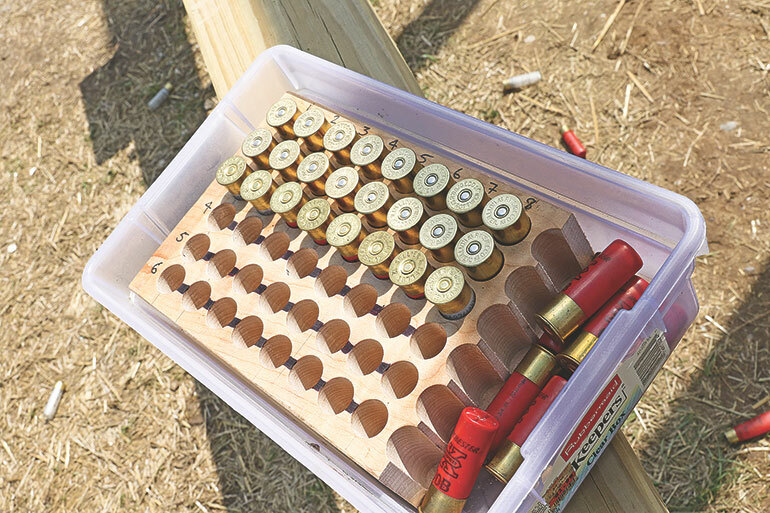 Set up a sheet of paper or cardboard at 25 feet, and shoot enough buckshot loads until you find the load that patterns right onto your bead or sights, and has a consistent pattern. Which load? There’s no telling, because trying to predict what your shotgun and any buckshot will do is like predicting what a redhead is going to say or do next. Since you do not have any extra ammo in the gun, you’ll have to make sure you don’t miss. But do have a spare shell standing on the rail, for a follow-up shot to clear a table and get a tie-breaker. These days, I do not leave shabby tiebreakers on my scorecard. Even when I have a clearly winning time, I make sure the back up time is good enough to still win. I hate to sound like a broken record, but in this Optional I am a record-setter. Back in the old days the category was finally split into separate pump and auto Events. I set the record for each, but I am not the record-holder of either. I set the fastest time with an auto, of 2.6 seconds. My tiebreaker was a miserable 12-something seconds, because who needed one, right? My friend the late Terry O’Hara tied me on the last day, took first place with a better tie-breaker, and as a result is the official record holder. Slow learner that I am, I did the exact same thing (well, my tiebreaker was a bit better) with the pump, shooting 3.6 seconds, and being tied by Terry. Again, he is the official record holder. These days, I do not leave a sloppy tiebreaker on my scorecard. If a pin is lumpy, or there’s a bullet stuck in the side (maybe yours) it will be even more difficult to shove it off the table. Stout loads rules Up North. Eight pins also, but only a six-shot revolver. You must reload, and you must clear the table. Scoring is pins on the ground or your time just keeps ticking. This is where that revolver set up for full-moon clips is just the ticket. But remember, you have to put them on the ground, so a moon-clipped .38 won’t do it. The big choice here is an S&W in .45 ACP. With full-moon clips, and stout loads to clear the pins off the table, you’ll be shooting double action. You can, however, build it with an 83⁄8" barrel, if you can find one. You can also send your revolver off to Mag-na-Port, who will be happy to port it, which the rules allow. Oh, and by reload, the rules are clear: you have to load up the same revolver you just shot six rounds out of. A Pin Gun has a comp or muzzle brake on it, but no red dot sight. The classic caliber is .45 ACP, but a lot of others will work. Just not the .40. trust me on that. You and a buddy have to shoot thirteen pins off the table. You do this together, and the pins have to have been shot onto the ground. Deadwood keeps the clock ticking. Oh, and to make things tougher, there are a pair of penalty pins crowded in there with the others. Plan on shooting this with your Pin gun or Stock gun, as your Concealed Carry gun won’t be competitive and your Space gun won’t be allowed. You can, if you want, change teams. If you and your shooting buddy just aren’t clicking on the tables, you can sign up with a different partner. Oh, and if your partner is a woman, she just brought your team a second-off bonus. Here’s the catch, with Two-man and all team events; you can only go to the prize table once in that category, obviously at your highest standing. The Stock Gun event is just that. You could take a pistol right out of the box and win the event, if you practice. In the old days, we had to build pistols this good, now you can buy them from half a dozen different makers. So, someone who wins it, but is also in a different two-man with other shooters, and places third, fifth, etc, is only going to go up their first time. That means the loot goes deeper down the list. One handgunner, two shotguns, 24 pins, and no penalty pins. For obvious reasons, this event has been known through the years as Rolling Thunder. 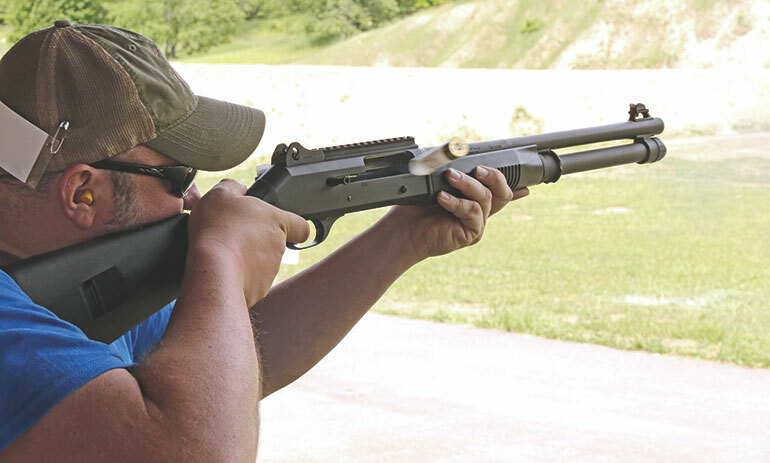 The handgun must meet Stock Gun rules. 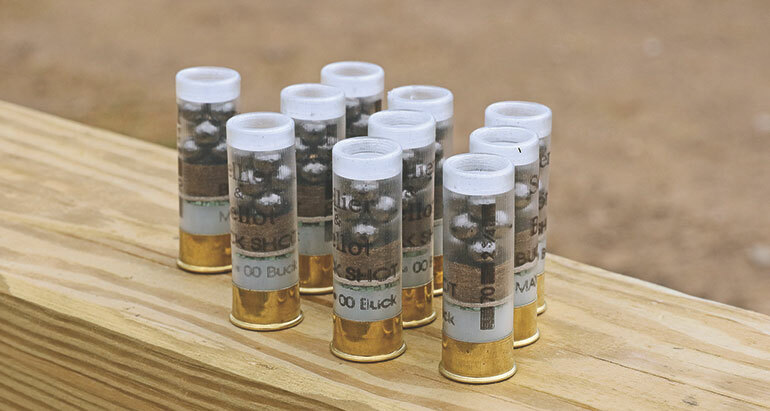 The shotguns must not have more than eight shots in them, and the buckshot must be larger in diameter than #4 buck. Bonuses; pump shooters get a full second off the team run. Women shooters get a full second off the team run. Yes, you can double-up, so a woman shooting a pump earns the team two seconds off. Extra bonus: a woman handgunner also gets a second off. An all-woman team, shooting pump shotguns can earn five full seconds off their run. Good luck, ladies. You can shoot so much, you need to find methods of ammo management. Here, a shooter has his shotgun ammo ready to load up, for the three-man team event. OK, the regular pin “set” is for them to be three feet from the back edge of the table. You have to push them off to score. How about instead an event that has a trough, and the back edge of it is 14.5 feet back? That’s right, the back of the table is the length of a Honda Accord behind the pins. Your .45 ACP+P is not going to do that on one shot. Probably not even in three. A full-house factory .44 Magnum won’t do it on one shot, and two is dicey. This is the province of the really big bores; the .454 Casull, .460 S&W, .480 Ruger and .500 S&W. If you really want the pins in The Big Push to pay attention, you need to be using something like a .500 S&W Magnum. Here is your setup for The Big Push. Yes, you have to shove the three pins all the way to the back of that trough, and off the steel. Good luck. If you really think you can load your .44 Magnum hot enough, I really need to quote the Dread Pirate Roberts from The Princess Bride: Get used to disappointment. 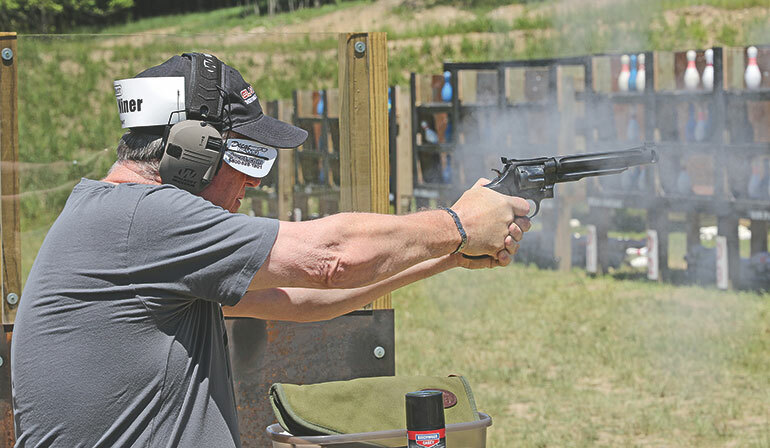 The only way you could get even close to enough horsepower is to load up in a single action Ruger revolver, and single-action shooting is not going to be fast enough to win. Oh, and leave your AR pistols at home. The really big bores, the .450 Bushmaster, .50 Beowulf, and the like are just too much. It has to be traditional handgun rounds, more-or-less, in a traditional handgun; revolver or pistol. Meanwhile, over on the long-range range (all of 90 yards) there are shooters with shotguns and rifles. The rifle event is a team effort. Two shooters with rifles, one sitting, one standing. Mow down 39 lollypop targets, and the fastest time wins. Yes, women get a second off. Also, putting a suppressor on each rifle nets each a second so that could be two seconds off a run. Two women, with suppressors? Four seconds. The shooter sitting gets to use a bipod and sandbag, but the standing shooter has to forego any support. It is called the .223 event, but you can use a pistol-caliber carbine if you wish. But the plates, at 90 yards, are only six inches in diameter, so choose wisely. Use iron sights on the shotgun with slugs event (aka 12x12) and you get a second off of your run. And you earned it. Scopes? Lasers? Your choice, knock yourself out. Bigger calibers? Sure, you can use a .308, but do you really think you’re going to shoot as fast as the competitors using .223? I thought not. No belt-fed, and any magazine capacity, but since the rifle starts empty on the table, you’d better be able to handle that coffin-mag ammo holder quickly. 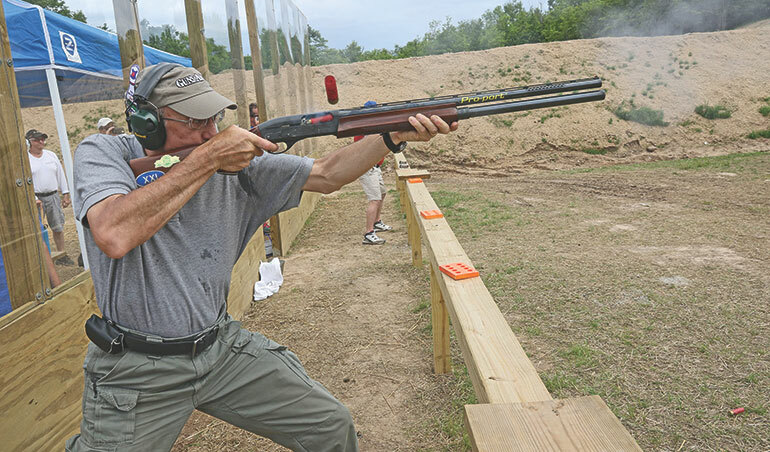 Shotguns, like everything else, start “Guns on the Rail.” From there, it is a loud noise and a few seconds to glory or not-glory. Repeat as necessary. A shotgun, with slugs, on falling steel plates. This was twelve falling plates out to 88 yards, but for 2019 it will be only eight plates. Iron sights? A second off. Pump? Another second. Woman? You get the idea. Yes, additive, so it could be three seconds off the run time. Start with the shotgun loaded on the table, and spare ammo at hand. No magazines, no tube reloaders, only slugs. Optics? Sure, but you give up that one-second bonus. And yes, the event has been won, and decisively, by a shooter using a pump shotgun with iron sights. For 2019, two of the plates are gongs, six of them you have to knock down. Pumps get a full second off their run, and they need it. Do Not believe people who say they can work a pump faster than an auto can cycle. Pin shooters have heard it for decades, but have never seen it. Entries the same as 223x39, or until your shoulder falls off from accumulated recoil. The details are still in the works, but there will be a .22 rimfire rifle event, called the 22x22. Bring your accurate rimfire rifle, and your 25 round magazines. Every year the Pin Shoot has been held, there has been a surprise event, something dreamed up and being tried. So don’t be surprised at what herculean tasks might be offered as a contest, in 2019 or in the future. One event definitely being planned for in 2020 is a PCC event. What is all this for, the massive amount of shooting, over a week of vacation time? For prizes. The prize distribution system is clear, fair and the cause of anxiety as the week goes on. The winner of each event gets to step up to the prize table for that event first, and select what they want from the loot. Next-fastest, and so-on, until the prizes are gone. You can post the fastest time in an event on Monday, and find yourself pushed off the prize table by Friday. However, on the Optionals, you can re-enter when, on say Wednesday, you see you have been pushed down the list. A happy three-man team, with their loot. If you win, you get to pick first from the prize table, so shoot fast, but don’t miss. Re-enter, post a better score, and move back up the list. Things can still shift. I found myself on one Friday, having lead the shotgun event since Tuesday, having been pushed to second place. I had been tied, but the other guy had a better tie-breaker. You know where this leads to. With fifteen minutes left of shooting time on Friday, I got my gear, signed back in, got on the line, and shot a tiebreaker better than his, and got back into first place. That’s the kind of competitive environment you can be in, if you wish. Or you can just shoot for the fun of it, because it is fun. In the team events, as soon as a person has been up to the prize table once, if their name is called again, the next team has to decide; who gets up first in the team? Because that person goes up in place of the person who would have been there a second time, followed by the rest of their team. And that offset carries over to the next team, and so-on. Once the prizes are gone, then the survivors talk about the match, pack up, and plan for the next year’s shoot. Ok, what does it take to truly broom a pin off of a table? We can spend days calculating the Newtonian Physics of it, or we can just take a S.W.A.G. based on experience. In a nutshell: you’d better be marshalling 195,000 as a power factor, or you will not be walking up to the prize table. That is bullet weight in grains, times velocity in feet per second. 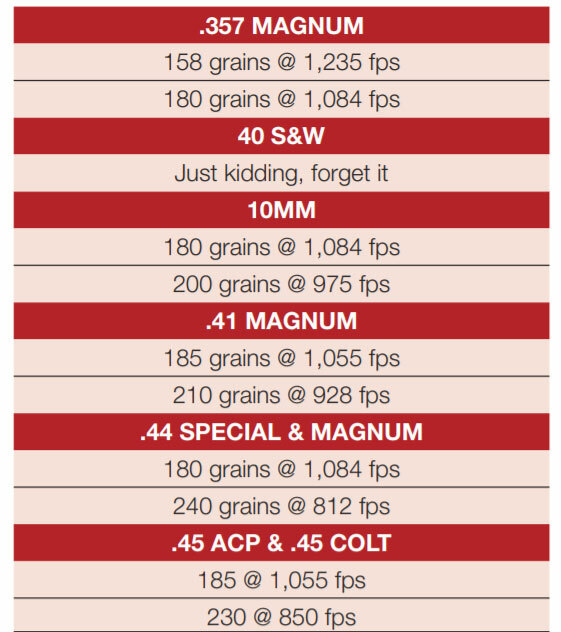 Your basic .45 ACP hardball load, a 230 FMJ (a not-good bullet shape choice, by the way) will generally be going 825 fps, for a grand total of 190,000. Let’s drop the extra zeros, shall we? The 190PF, combined with the hard, round nose, means lots of deadwood, and unhappy pin shooters. So, we have to step up to .45 ACP+P, and go with a JHP. Boot that 230 up past 850 fps, and life gets good. More than that can be good, up to a point. When the extra horsepower starts to slow you down, then you have begun fighting the law of diminishing returns. Generally, that kicks in at the 205 to 210 PF level, and from there it is all downhill. Except, of course, for The Big Push. There, a 195 PF isn’t even a warm-up, and you have to be shooting (I kid you not) a 400PF if you expect to be happy with the results. The 9x12 Event is just the opposite, all you have to do is tip the pins over, and any 9mm ammo you find on the shelves will be more than strong enough for that. Buy the cheapest 115 grain FMJ ammo, by the literal bucket, you can find on the store shelves, and shoot that. The last of its kind: the last Benz given away in pin shoot drawings. OK, when the line isn’t shooting (it takes time to re-set pins, get finished shooters off the line and the next relay on) it is time for Trivia. History, firearms, even Shakespeare, Richard asks trivia questions. Don’t shout out the answer. Stick your hand up and shout “Ooh, Ooh!” If you answer correctly, you get a ticket to the drawing, and a token prize like a 12-gauge buckshot round. If you place in the top ten in an Event or an Optional, you get more drawing tickets. And what was the drawing for in the past? A Mercedes Benz. Yes, it was used, and yes it had miles on it, but it was yours. For the winning ticket, you got wheels. Alas, all the cars are now gone, we’ll have to content ourselves with other prizes for 2019. When Is The Pin Shoot? The shooting is from Friday, June 7, through Friday, June 14th. Sign-up starts in January of 2019, and early enlistees get discounts. If you need more info, pore over the web site at PinShoot.com, or track down and interrogate an old pin shooter at your gun club. The row of firing points and pin tables up at The Pin Shoot. There will be more grass in 2019, and more shooters, but the process will be the same; shoot fast, don’t miss, and you’ll win loot and glory. The Pin Shoot is a match that is different in one other way: it is still Richard’s party. There is no rules committee, no college of shooting cardinals, (but Richard does consult some of the old-timers for their input) and when Richard sets a rule, that’s it, that’s the rule. He has been a most benevolent dictator, so count on things being fair, but there is no appeal to rulings. Hey, it has worked since the mid-1970s, there must be something about it, right?